In December, BuildBlock Building Systems announced that their popular line of insulated concrete forms (ICFs) will be made at Benchmark Foam’s facility in Watertown, South Dakota. Located just 100 miles north of Sioux Falls, this new manufacturing facility is perfectly located to supply BuildBlock products for both central and northern states. 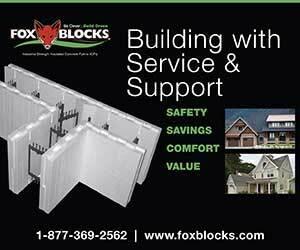 BuildBlock products are also made in 10 other manufacturing locations across the U.S.
Eco Building Systems (EBS), a composite “gray block” manufacturer, is expanding manufacturing locations. A plant near Ottawa, Canada is set to open in the first quarter of 2018, to supply Ontario, Quebec, and the Northeastern United States. A second plant is also set to open within a few months in Jamaica in order to meet demand for hurricane-resistant structures across the Caribbean. EBS founder Jerry Kachlic says that he anticipates additional agreements this year will establish manufacturing in Washington State, and several other locations across the globe including India, South America, and Africa. He notes that the headquarter facility in Phoenix, Arizona, has a complete training center for those interested in learning how to design and build with the Perfect Block system, and that the company offers full support including drafting, engineering and project consulting for seamless operations. In November, the National Ready-Mix Concrete Association (NRMCA) hosted a tour to promote ICF schools. Organized as part of their Build with Strength campaign, local Kentucky concrete producers, developers, and school officials from across the country toured three schools, all of which are built with ICF and located in Bowling Green, Kentucky. These are Richardsville Elementary, the nation’s first (and so far only) net-zero school; South Warren Middle & High School, the largest school in Kentucky and the largest ICF building in the U.S.; and Jennings Creek Elementary, which is still under construction. The tour emphasized the improved energy-efficiency and lower lifecycle costs ICFs can provide to school districts across the country. Warren County schools have saved $11 million since 2003. ICFs are quickly becoming the building material of choice for educational facilities due to their strength, energy efficiency and ease of use. Many see this as a sign that ICFs are becoming mainstream. Douglas Bennion, training and technical director at Quad-Lock, says, “This might not seem like such a big deal, except that the previous version of this guide was 100% ‘wood-centric’, and made only passing mention of ICFs as an alternative building solution. While not perfect from our industry’s point of view, this revision actually represents a rather large leap forward. Additionally, we now have a seat at the table and are being consulted during formulation of similar documents. 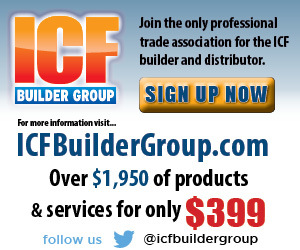 A 16-story mixed-use development near New York City is poised to set a new record for the ICF industry. 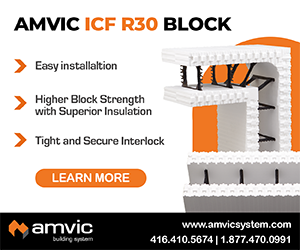 While a handful of ICF buildings exceeding 16 stories have been built in Canada, the project will reportedly be the tallest structure in the U.S. to be built with Insulated Concrete Forms (ICFs).The innovative project, 42 Broad Street, will also be among the most energy-efficient large-scale buildings in New York. The development is a luxury transit-oriented-development (TOD) and consists of 249 luxury rental apartments, approximately 20,000 sq. ft. of retail space, and an adjacent parking garage. It’s funded by The Bluestone Organization, Alexander Development Group, and institutional investors advised by J.P. Morgan Asset Management. Fitting the character of the neighborhood, tenant amenities will be first-class. Plans call for a heated swimming pool, large community/party room, fully equipped gym, and a library/reading room. The exterior walls will be built using panelized ICF wall segments stacked at an assembly plant off-site and delivered ready to brace and pour. Bucks, weld plates, and lintel rebar are installed prior to shipping. The majority of the reinforcing steel is replaced with Helix micro rebar, which creates a stronger concrete with better consolidation and pour characteristics. Last summer, Logix ICF released an installation guide for XP-1, their “one-sided” ICF that allows one face of the wall to be exposed concrete. The installation guide can be downloaded from the Logix website.